My son Sam just returned home from Greece last night. It is a moving experience to hear about the refugee situation first hand from a loved one. Sam you just got back from Greece. Please tell us, why did you go? I wanted to try something different–something that I felt would challenge me. 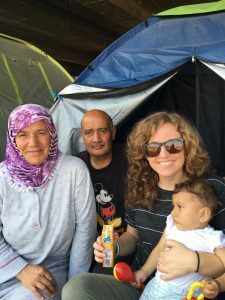 I went to Athens, Greece with a friend, Hayley Smith of Lifting Hands International and we stayed with a refugee family from Syria. They were a wonderful family with three daughters. They told me all about how they had a good life in Syria before the war—they had a house, a car. The dad was an electrician, the oldest daughter was in her first year of college. The situation became dangerous very quickly in Syria—it was dangerous to go outside after awhile. The oldest daughter was in a car explosion and saw people die. Pieces of glass and metal are still in her body and in her face. They decided they needed to leave. They tried to leave Syria—they fled in the middle of the night and walked in the mountains. Then they finally made it to Turkey. They were there in a camp for ten months. They tried to come to Greece three times—on the third try, a Greek ship picked them up and brought them to Athens. 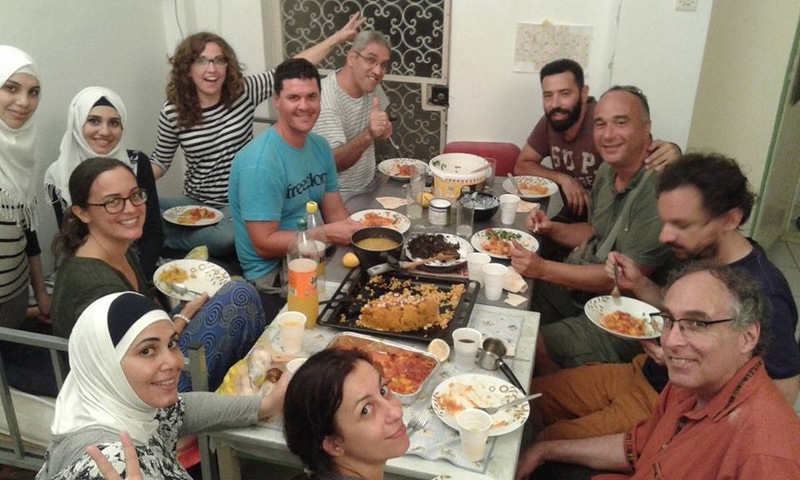 They live in an apartment in Athens now and they feel that they are lucky. Most people live in tents there. These Syrians are great people. They appreciate small and simple things, like eating a meal with their family or sitting around talking. They cherish that kind of thing—it makes them happy. I also learned that every race, every type of people have been refugees at some point. It is important that we help them—our grandparents have been refugees. They really need our help. The majority of refugees want to go back to Syria if it was rebuilt and if it was safe. They really don’t want to be here. They don’t have a choice. Sam, you have only been home about 24 hours—as you reflect on the trip and what you experienced, what are your thoughts? It is just so sad in the refugee camps– the conditions they live in. 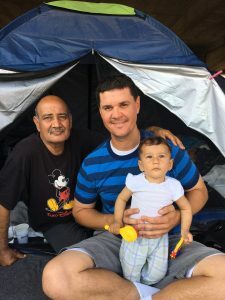 Imagine camping outside with your family in a hot climate in an ugly dirty cemented area. There are people there who have not had the facilities to wash their clothes in weeks. I think they have three or four showers for 300 people. It is very difficult to keep clean there. They are fed carbs and bread and generally do not have good food in this camp. We took them food, clothing, and hygiene products. They were so grateful. We talked to them and encouraged them. We held their babies and played with their children. I broke up a fight among a few young children who were arguing over a soccer ball, just like children everywhere do. These Syrians are beautiful people who have seen and experienced so much heartache in their lives. You go there for a few hours and experience it and it is hot. It is hard to be there. These people stay there all day, with babies and young children. There is nothing there to do but to wait. Please pray for them and help out in any way, if you can. Please share your thoughts below and consider offering your support to Lifting Hands International and other refugee relief efforts.